Are you planning a Milestone Wedding Anniversary or Vow Renewal? It’s been decades since you walked down the aisle. Now, you’re about to do it again. You’re nervous; you fiddle with your bouquet as you peer through the doorway to the church nave. There, at the end of what seems to be a kilometer-long aisle, stands your bridegroom. He’s beaming. 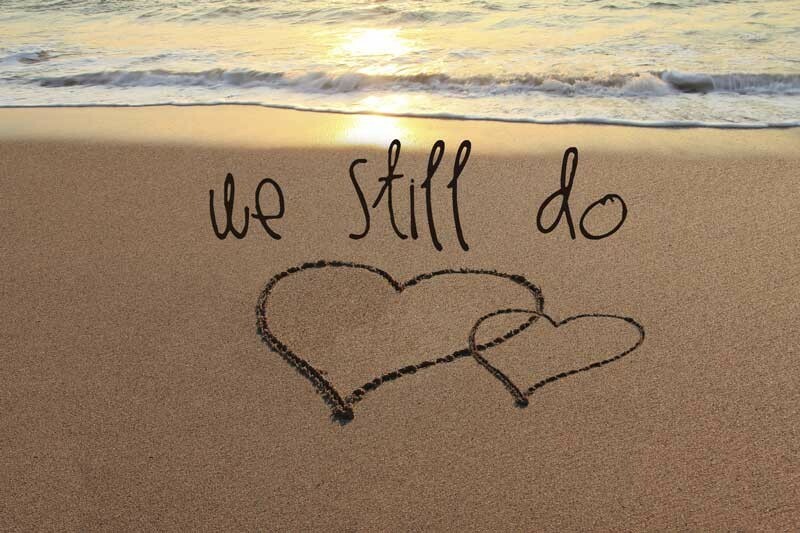 Are you planning a Milestone Wedding Anniversary or Vow Renewal? The wedding music swells, you open the door, and—following your bridesmaids—you make your way past your guests to join your husband of 50 years at the altar. Wedding vow renewals are a wonderful way to celebrate a special anniversary, especially if it encourages more of your friends and family to come from all corners of the continent to share your special day. Whether you plan a grand event that would put the Windsors to shame or stage an intimate garden soirée, you’ll want to include romantic elements to set your anniversary or vow renewal apart from the usual family gathering. This day, after all, you and your husband come first; it’s about the years you’ve shared, and the love that’s begun the first chapter of your family’s history. When it comes to traditional weddings, everything’s critical. The venue. The dress. The rings. Even the food is a huge investment; after all, your guests are helping you kickstart your marriage with wedding gifts, so the least you can do is send them off with full bellies. While you can certainly go all-out with all the trimmings, most vow renewals are a scaled-down version of first-time wedding celebrations. So what are the three most important elements to include in your party? It’s been years since everyone’s been in the same place, much less dressed up. Why not take the opportunity to plan some family portraits, and capture candid shots of everyone reconnecting and enjoying themselves? Many professional wedding photographers offer scaled-down packages for family gatherings, and as vow renewals have become popular, they’re used to such requests. If you’re on a tight budget, or only want the photographer for a few group photos, the best way to save money without trusting your event to an unskilled dilettante is to ask a seasoned pro to recommend an apprentice or a newcomer who has earned a reputation as an “up-and-comer.” Believe it or not, professional wedding photographers love to refer business among reliable and talented colleagues. Music bonds us to our memories. Consider how certain songs affect you when you hear them. Undoubtedly, it sends you back in time or prompts you to reach out to the friends you hold dear. Why not hire a professional wedding band to play the soundtrack to your original wedding day? What song was playing when you paired up for your first dance as husband and wife? How about asking your wedding singers to give your wedding song a contemporary twist, just for fun? Your own parents might not be around to share this special milestone, but sons and daughters can “cut in” before the rest of your guests join you on the dance floor. You can use live music throughout the night to celebrate multiple generations of family and friends; wedding singers and bands are able to maintain a theme while transitioning between genres when digital playlists might not have such an inclusive feeling. If you decide to opt for cocktails and forego a formal dinner, at least be sure to celebrate with wedding’s favourite icon: The cake. In addition to providing a marvellous photo opportunity, you can commission a replica of your original wedding cake. Do you still have the cake-topper figurines? Dust them off, and give them another day in the limelight. Dress up the cake table with photographs from your original wedding ceremony and reception. As you cut the cake, your photographer can line everything up for an amazing image that explains the entire theme of the event in a single frame. Whether it’s your fiftieth anniversary or your fifth, each year you spend with your spouse marks challenges overcome, new discoveries, and insights into what makes that person special. Looking through your personal mementos, you might uncover photographs that suddenly have new meaning or ordinary trinkets that remind you of an extraordinary day. Bring along these items to share with your guests, and invite your loved ones to bring their own photographs of the two of you together or among friends and family. You’ve walked more than an aisle’s distance to build a relationship with your spouse; from this vantage point of your marriage’s history, you can look back with a whole new appreciation for your journey together. Don’t take shortcuts now. Celebrate your major anniversary or vow renewal in style.